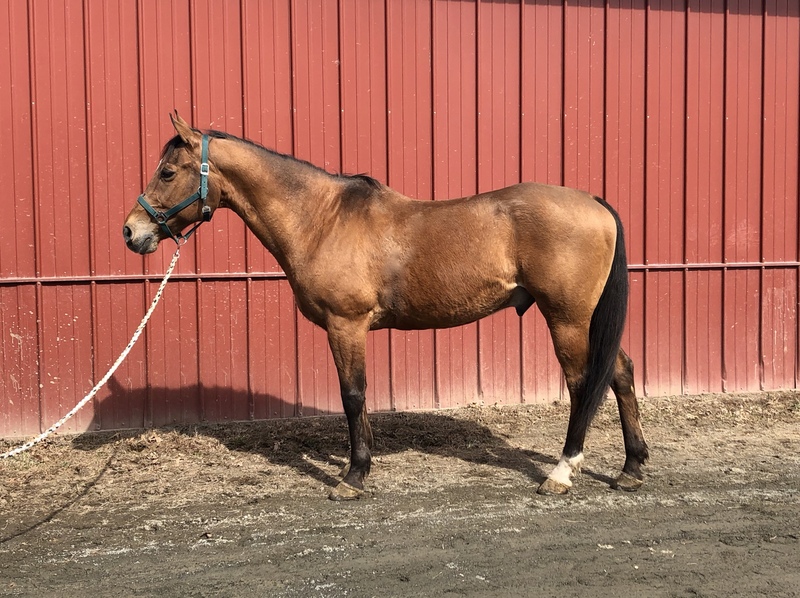 7 Bay QH Gelding, 11yo, 16.0 hands, W/T/C, nice mover, Jumps, has both leads and smooth and steady gaits. Will also go Western. Gentle and kind, he has taught kids how to ride, has a nice slow canter, great whoa, backs up, turns around both ways, has excellent ground manners, easy to catch, load, haul, stands tied, easy to groom, pick feet, saddle, bridle, stands for mount and dismount, good for the vet and the farrier, and good to bathe, and gets along with other horses. He is happy left turned out or kept in a stall. This is the kind of horses you can just catch, and put in the trailer for your next show or trail ride. 12 Reg. QH Grey Mare 7yo, 15. hands, Western or English, has both leads and quiet and willing attitude, will take you to the shows on Saturday and trail ride on Sunday. Super sweet! This mare is ready to go do whatever you want her to do! She is very classy and just a joy to have around!!! She floats around, trots, and lopes both ways soft and quiet, has a big, quick, soft stop, backs up, turns around both ways, sidepasses, and has her leads. She is super broke and quiet, no-nonsense. 14 Grey Gelding, 9yo, 15.1 hands, Cute mover, W/T/C Jumps has both leads, has been trail ridden, crosses water, good on the road. He has a quiet way about him that you can only hope for! He is the kind you will want to keep forever. Perfect to go ride the pastures, teach the grandkids to ride and do a little ring work. He is gentle and quiet; great for the whole family. He can be left off for periods and comes back gentle and quiet. 18 Reg. QH Chestnut Gelding, 14yo, 16.1 hands, Big bodied, Western or English, perfect for any level rider. He is so fun to ride, has a round, smooth, low-headed lope and jog, big stop, goes around on a loose rein. He is very solid, he is ready to haul and compete. He rides outside quietly, has been down the trail, crosses water, good in traffic, will ride out alone or in company, will lead or follow. Has been hauled to events and away trail rides, and is great in new places. He has an adorable puppy dog personality. Excellent ground manners, no bad habits or vices, easy to catch, lead, load, haul, stands tied anywhere, easy to clip, bathe, groom, pick feet, saddle, bridle, and stands well for the vet and for the farrier. 24 Double Reg. Paint/QH Chestnut Gelding, 9yo,16.0 hands, W/T/C pretty, moves nicely in a frame, has both leads and a willing and confident jump. He is talented and athletic and he loves to please! He is quiet and confident out on the trail. Solid ground manners, very, very polite on the ground, easy to catch, lead, load, haul, clip, bathe, groom, pick feet, saddle, bridle, stands for mount and dismount, and perfect gentleman for the vet and for the farrier. He is super well mannered in the barn, around other horses, quiet in the ring, and rides outside quiet alone and in a group of horses. You can't find one with a more lovable personality! 27 Buckskin Pony Mare, 10yo, 14.0 hands, Fancy Show pony, W/T/C Jumps, has lead changes and will jump a course. She is light of your aids and tries hard to please, has great ground manners, easy to catch, load, haul, stands tied, easy to groom, pick feet, saddle, bridle, stands for mount and dismount, good for the vet and the farrier, and good to clip, bathe, and gets along with other horses. 32 Reg. QH Chestnut Gelding, 12yo, 16.1 hands, W/T/C Jumps, has both leads, would make a perfect 4H Show horse. Big boned, nice bodied, sure footed Gelding with an excellent personality. He has been used in all aspects of riding and has been trail ridden extensively. He tries hard to please! He is simple to ride, can be kept stalled or in the pasture, he's easy to catch. He trail rides great out alone or in a group. Gets along with other horses well and is an easy keeper. Loads, hauls, is great around other horses, in the barn, tied to the trailer, good for the vet and the farrier, is good to bathe, groom, pick feet, saddle, bridle. 34 Bay Gelding, 10yo, 15.3 hands, Super well trained, Western or English, quiet on the trail and in the ring. Knows his job and is happy to do it. He is a super sweet, in your pocket guy with a sweet face and kind eye. He is a nice bodied and stout gelding. He has a great handle, nice stop and excellent neck rein! He is a great trail riding horse. He is great in traffic and commotion. He would be a great drill team horse, parade horse. He will cross water and go through obstacles. He is easy to catch, lead, load, haul, stands tied. Easy to bathe, groom, pick feet, saddle, bridle, and quiet for the vet and farrier. Stands for mount and dismount! 36 Reg. QH Bay Gelding, 7yo, 16.1 hands, Elegant show horse, Point earner in Hunter Under Saddle. Will also do well in Western Pleasure, and good on the road and down the trail. He has great ground manners, easy to catch, lead, load, hauls, stands tied anywhere, easy to clip, bathe, groom, pick feet, saddle, bridle, stands for mount and dismount and is good for the vet and the farrier. Loads in the trailer well and is quiet in new places. Always a great selection of Registered Quarter Horse, Warmbloods, Western Pleasure, Family/Trail Horses, Hunter Jumpers, Registered Paints/Pintos, Draft Crosses, Dressage Horses, Ponies, Eventing Prospects.